After some research on balancing training frequency, volume, and intensity, I decided to roll this program out on August 1st and give it a go. The idea was inspired by a good deal of curiosity and respect for Olympic athletes in gymnastics and weightlifting, who train very frequently, and develop amazing physiques while improving at their respective sports. When asked, “How do you feel?” I found it necessary to clarify between the mechanical stress and the neural stress. My body felt awesome. I wasn’t sore at all, EVER, my knees didn’t explode, my back felt awesome; it was pretty cool. While reading up on higher frequency training, the absence or reduction of soreness was something that I was interested in. However, the neural stress was pretty bad. After the first few days, it caught up to me, and I was exhausted. The first Thursday ‘off’ day was a welcome moment, but by Sunday I realized my brain wasn’t very happy with me. I had several nights where I logged about 10 hours of sleep, and the caffeine in coffee had lost any powers to give me a jolt. I had some thinking to do. After two weeks of this “squatting experiment”, which I had intended on being a 4 week long journey through August, I decided to pull the plug two weeks early. Back to more conventional programming, but with some valuable lessons. Everyone needs to squat more. Even a few minutes a day of squatting will help you feel more awesometastic: I’m going to include squatting related drills in my daily warm-up and cool down routines. Most of the world still goes to the bathroom in this position, and consequently they don’t walk around in the zombified state of those who enjoy lumbar support and “comfort height” toilets. I realize I see my best results with a moderate frequency and moderate volume approach, including several high-intensity lifts each week. I didn’t see progress when I followed the body part split standard that put lower body exercise once a week. This experiment, with squats 6 days a week, was too much. As I review my past training, I’ve made my best progress with 2-3 days per week of lower body emphasis, including maximal effort work, dynamic effort (speed) work, and sprint-based conditioning. All three emphasize type II muscle fibers and stress the nervous system, but balance mechanical stress and overall athleticism. While I’ll be performing a body weight squat pattern in some context, every day, I’ll be keeping my loaded squats to 2 days for now. During one of my workouts during the Second Week of Squatting, a high school student asked, “Hey, do you only do legs? I think I’ve seen you squat every day this week.” I tried to tell him that it was to make up for the overall lack of squatting, but I couldn’t keep a straight face, so I explained my little experiment, and advised that he try some Goblet squats in between his other exercises. 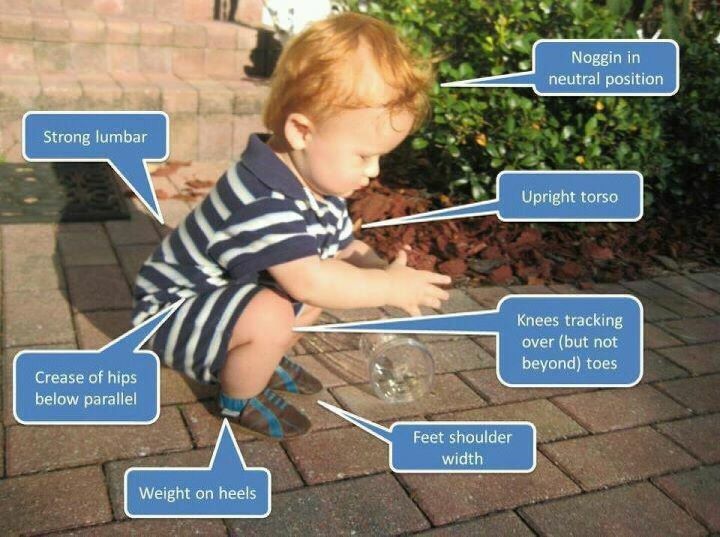 Hopefully he’ll become a regular squatter, and enjoy a life of improved movement quality, improved strength, and improved awesomeness. You can try the same, and employ body weight squats in daily activity drills, between sets of other exercises, and throughout your day. It’s an easy but effective way to make sure that you squat more. Good luck. O-lifters do some kind of squat practically every day. That they do; they certainly inspired this little experiment. In the past few weeks, I’ve found that some form of light(er) Goblet squat and body weight squats on off days feel a hell of a lot better, and it’s making it much easier for me to recover yet retain mobility on a daily basis. yes Bear138 they certainly do, as the squat is the foundation of both of the lifts, it’s like a quarterback throwing the ball everyday. If your just lifting to be awesome maybe EVERYDAY is not necessary, but the more I squat the better I feel, and general strength has increased all around from squatting. Best weight room decision I have made. “How you feel is a lie” – Damn straight! I’m considering playing around with this again in the future. I have a 6 week “body comp” split set up to use after my next meet is over, but I want to play around with some fun training before setting up a template for my next meet once I find one.